What happens when givers of life give a lifetime of tears? The story of fatherlessness is written into the heart of our generation. It is heard in our songs, seen in our movies, read in our blogs. It is a story of shame, loneliness, and rejection. A story of missed potential and wasted opportunity. A story that desperately needs to be heard. But fatherlessness is more than a personal tragedy. It is a growing epidemic. Fatherlessness is a driving force behind gangs, teenage pregnancy, drug abuse, and suicide. And all too often, the fatherless are either marginalized or ignored. In Fatherless Generation, Dr. John Sowers asks: How can the faith community begin rewriting this tragic story? 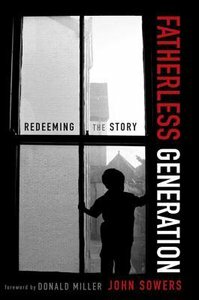 Written for those who are fatherless themselves and those concerned with social justice, Fatherless Generation uses culture, statistics, and testimonies to remind us that it is possible for a generation to find healing. Drawing on years of research and personal experience, Dr. Sowers shows us that intentional, intergenerational mentoring is the key to a new story of hope. It is in relationship that this generation has been wounded and it is in relationship that healing must begin. Mentoring is the most strategic way to reconcile our generation with God. Weaving in his own experience of fatherlessness, Dr. Sowers eloquently presents the desperate reality of fatherlessness in our culture and how awareness and compassion offer a solution of hope---a hope that will write new stories for generations to come.